Relative Rotation Graphs – It’s kind of like cheating. 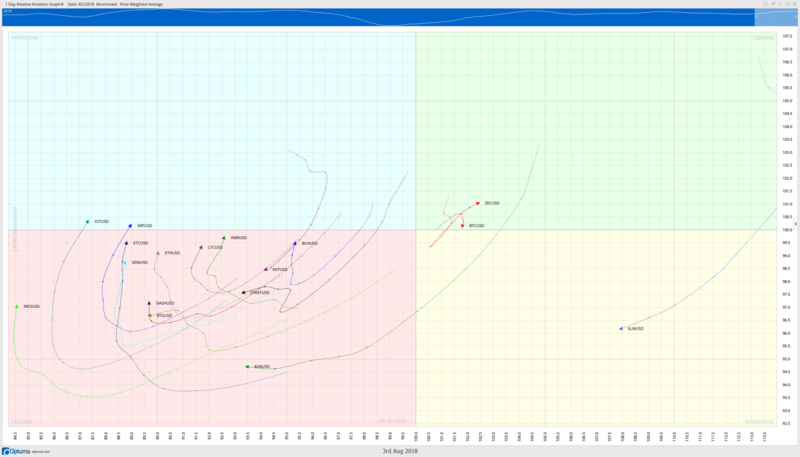 One ‘newer’ types of technical analysis with the Optuma by Market Analyst software is the RRG or Relative Rotation Graph. It’s a truly wonderful ‘at a glance’ view of a number of instruments and how they perform against a certain instrument/index/currency/coin/etf/etc. Not only do you get at a glance’ but you get a ‘what not to buy right now’ and a ‘what I should buy right now’ series of signals. Let’s break this badassery of an indicator down. There are 4 quadrants that make up the RRG: Leading, Weakening, Lagging and Improving. Each has a particular way to view the market and to interpret the data. Think of the word rotation and imagine things going in a clockwise circle. Now that doesn’t always happen, but generally, there is a good rotation. When an instrument is inside the Leading Quadrant, we can consider it to be ‘overbought’. At least that’s how I think of it. The big-man at Optuma did a video a while back and compared the Leading Quadrant to a race and whatever was in the Leading Quadrant was ahead of everyone. We don’t want to buy things in this zone. We want to look at the chart and more than likely sell when the arrow points and moves down towards the Weakening Quadrant. When things move into the Weakening Quadrant, we can assume that there is some selling going on, either a fast initial sell off or just a steady bearish move. Things in this quadrant are things we want to keep an eye on because they are going to be the future instruments to buy, especially when they move into the Lagging Quadrant. This is the awesome Quadrant for bulls. When things enter the Lagging Quadrant, we can think of them as ‘oversold’. Things are just really bad when they move into here. But that’s what we want to see. We want to look at the chart and see if conditions are bullish coming out of a bottom or a swing low. We want to consider a buy when the arrow points and moves up towards the Lagging Quadrant. Whereas the Weakening Quadrant is an area we want to watch for instruments to buy, the Improving Quadrant is an area we want to watch for considering selling. The other things we want to recognize is that the farther something is from the center, the greater the trade and profit opportunity. The closer something is to the center, the more correlated it is to what it’s performance is being compared against. Let’s look at the crypto RRG. This is the RRG of the limited list of cryptos available with from Optuma. This current RRG is using a Price Weighted Average – so we are comparing the performance of all the cryptos against their aggregate performance (I know I’m slaughtering the definition of that, but hopefully you get the idea). Observe the condition of the cryptos in the Improving Quadrant and relate them to today’s price action. We can see that IOTA, ETC, DASH and a couple others (pointing up) are doing quite well against Bitcoin. Now what trade opportunities are looking good according to this RRG? XLMUSD is zipping across the weakening quadrant so we need to keep an eye on that chart. Additionally, observe NEO is waaaay on the outside – this might be the best-looking trade opportunity according to this RRG followed closely by ADAUSD. We should expect to see continued positive performance against Bitcoin with IOTA, DASH, XMR, LTC, XEM, and DASH – followed by some increased positive performance by ADA and NEO.